Yesterday I was reading all the emails I received during the last month- I was on holiday with little time for checking emails and updating my blog. 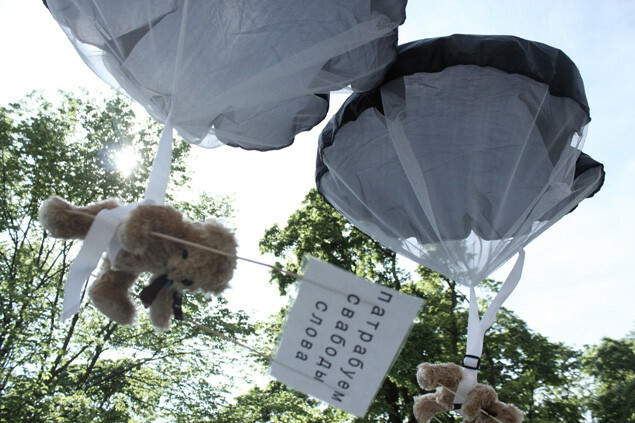 I stumbled upon the Free Speech in Belarus Teddy Bear bombing campaign by Studio Total, a Swedish PR agency. I was reading the story when my daughter Matilde came to my desk, watched the picture and said: “How cute! What is written there?” pointing her puffy finger at the sign held by the bear. I then found another picture, where the sign appears written in English (and frankly speaking it seems to me that it is photoshopped, therefore I do not know whether that is the correct translation, but I hope it is), I translated into Italian for her, adding a little bit of extra-meaning for her to understand the whole situation. That was a very good question I was not able to give an answer to, but I am going to ask to Studio Total what happened next. Matilde’s quesiton made me smile, but that also made me wondered how sometimes we forget that in many countries freedom is NOT a right, is not a natural thing that you do not even debate or, as Matilde added: “At school too I am not allowed to speak whenever I want. But if I ask for permission by raising my hand, the teacher allows me to speak. Maybe they just have to raise their hands”. This is a good pitch for another guerrilla campaign. What do you think? Pathways to Heaven: what happens to our past social feed when we die?